Go north young men. Eat, drink, see the peace walls and train your legs off. Ireland return to the regular surrounds of their Kildare base tonight and prepare for France, hopeful that a few days in the Belfast sun has done them the world of good. Concerned pundits and fans have been thrashing around for a cure for the team's poor form and many have come to the conclusion that an old-fashioned night of team bonding could do them the world of good. A down week provided the perfect chance and the squad appear to have made the most of a slightly looser leash. "We got a good bit of work done," second row James Ryan said of the camp. "Friday was our main (training) session. We've just enjoyed each other's company, went out for a bite to eat a couple of nights ago and did the Black Cab tour on Thursday morning. It hasn't been all work, we've got to enjoy each other's company a bit. "We had a few beers in Rome after the game as well. So it's important we can have a bit of craic and get away from the bubble. "After the game in Italy we were encouraged to have a few beers together, have a bit of craic. That's important when things aren't going quite right. "In terms of doing things different, I think we're not far away, just trying to get that bit better. We'll keep building and hopefully next week we can put the right foot forward." The business will turn serious this week as the French loom on Sunday. Ryan's return will help; he'll come straight back into the team after being rested for Rome and it looks like he'll be one of a number of changes to the team. 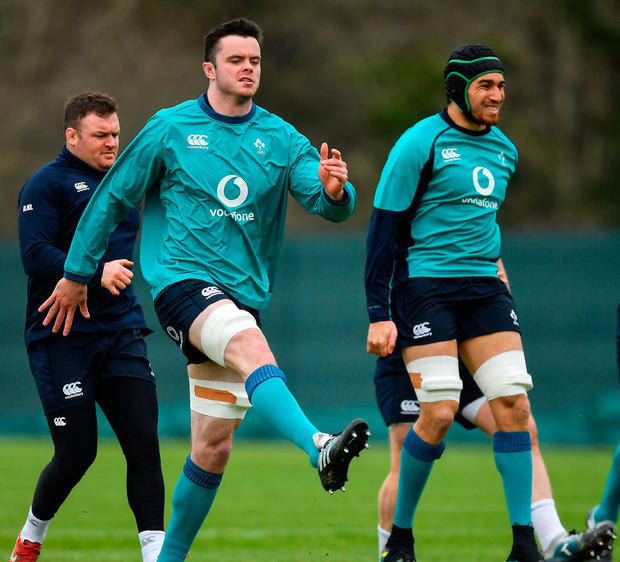 Although Conor Murray and Johnny Sexton continue to be given the space to play their way into form, it is not a one-size-fits-all approach. With Ryan's partner in crime Dan Leavy approaching a return to full fitness, Seán O'Brien was absent from the Belfast camp after an error-strewn, ill-disciplined performance at the Stadio Olimpico. Schmidt may have wanted him and Sean Cronin to play for Leinster against Cheetahs on Friday, but Leo Cullen wasn't playing ball. Both men are likely to be recalled to the squad, but their chances of featuring on Sunday are slim. With CJ Stander fit again and ready to take over O'Brien's vocal, ball-carrying role, it falls on Josh van der Flier to come into the team at openside. Leavy may be fit enough for a bench spot after a long stint out, while Jack Conan is another option with Tadhg Beirne able to cover blindside off the bench. The Connacht second-rows may have given a defiant performance after being sent home for the weekend, but the retained trio of Ryan, Iain Henderson and Beirne are a tantalisingly dynamic combination. Ireland appear to have been lacking on-pitch energy thus far, but it won't be lacking from the engine room. Schmidt will hope that by bringing Cian Healy, Rory Best, Ryan, Henderson, Van der Flier and a rested Stander back into his pack he will fix the energy deficit. By returning Garry Ringrose to his midfield, he'll have another attacking dimension. Robbie Henshaw is another option. He has signalled that he sees this final block of games, with a six-day turnaround between them, as a perfect dry run for the opening two matches of the World Cup against Scotland and Japan. The coach will feel that finishing a difficult Six Nations on a high will propel them towards that era-defining tournament with some momentum. Another pair of error-strewn performances won't help matters. "We can just be a bit more accurate," Ryan said. "I know it's a generic word, but if passes start to stick a bit more, if we're hitting the right lines I think it will start to happen for us. I think our set-piece is another area where we can get better. "When we're not performing at the level we know we're capable of, maybe we can get a bit over-anxious and start forcing things a bit. That's why it's important we just chill out as well. Get that balance between training - when we're on, we're really on - but when the work's done we can put the feet up for a bit." They looked anything but chilled on that taut day in Rome, but Schmidt will be hoping that a few looseners and an injection of new faces will have the desired effect as they look to finish on a high.